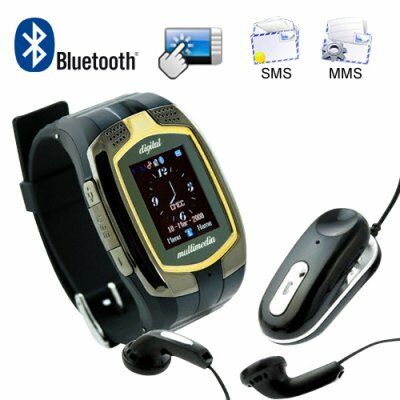 Successfully Added Classic QuadBand Cellphone Watch - Dual SIM + Touchscreen to your Shopping Cart. A new generation of our Classic 114 series, this 2nd generation model is a four band GSM (850MHz, 900MHz, 1800MHz, 1900MHz) mobile phone watch with two SIM card slots and quick touchscreen response. This model is fun to use and is also one of the smallest watchphones on the market today. A fully functional unlocked GSM mobile phone with a color touchscreen, built in microphone and speaker, Bluetooth, and rich selection of multimedia functions, this is the latest in a great line of China cell phone watches we have been introducing over the last three years. What could be better than calling friends from your wristwatch? With the Classic 114 calls are simple by using the watches built in microphone and speakers or with the supplied Bluetooth headset. The watch features a 1.4 inch screen that makes it easy to send and receive SMS and MMS messages as well as flipping through your phonebook to dial up Obama when you want to have a quick chat with your drinking buddy. And all this is done through an easy to use touch screen interface. When you are not making phone calls or sending/receiving text messages, this digital watch becomes a full featured digital media player and camera. Listen to music, watch videos, or take pictures all from your wrist. The future of cellular messaging is here now - the Classic 114. With all of the features of a modern mobilephone slapped on your wrist you'll never have to worry about forgetting to carry your phone, you'll lighten the load and provide a unique talking point for your friends. Great for cyclists, commuters, and anyone who wants to stop carrying round bulky products in their pockets or handbag. This is a wonderful product for the internet storefront and re-sale markets. Sure to be a great seller, order in bulk now to secure your stock and get the best wholesale prices and save on shipping. Proudly brought to you by the leaders in wholesale direct from China electronics, Chinavasion.